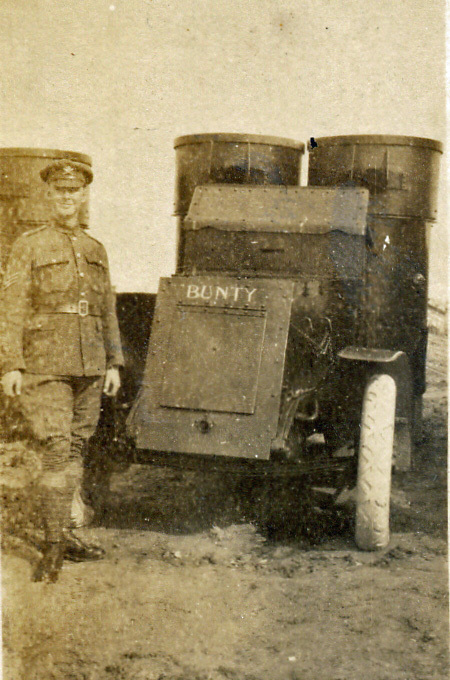 Editor’s Note: Tom’s personal diary entries continue after Tom is transferred to the Army’s Machine Gun Corps where he serves as a Sergeant and Staff Sergeant, 31 January 1918 to 15 March 1919. Jan 31, 1918 Go to Scotland Yard in morning at 9 am to be transferred to Machine Gun Corp, cannot get anything to eat or drink until 5 pm when they have finished messing us about. Feb 10, 1918 Leave Kings Cross for Grantham. Feb 11, 1918 Living in huts. Bad living. Go out every night to get a feed. March 12, 1918 Preparing and getting kit ready for Mesopotamia. March 13, 1918 Leave Grantham. Parade at 11.30 pm at Belton Park and march to station with all our kit, over five miles, each carrying 250 rounds of ammunition, rifle, tin hat & sun helmet, two blankets & ground sheet, overcoat, gas mask etc. Have a special train and go to Southampton direct arriving about 10 am next day. March 14, 1918 No issue of food all day. Go aboard boat at night bound for Cherbourg. March 15, 1918 Arrive at Cherbourg. March to Rest Camp, 4 miles away with all kit. Have our first meal issued since leaving Grantham, at 11 am. March 16, 1918 March back to quayside again. Get aboard train, in trucks which are marked 8 horses or 40 men. We are lucky and are only 29 men in a truck. Train moves off. Pass through Lison. Try to find room to lie down for the night, which we find just possible if we all lay on our side. Anyone caught trying to lay on his back gets the ‘bird’. Four of we follows form a ‘syndicate’ and buy up all the food we can, and also always make sure to lie down first at night. March 17, 1918 Arise in the morning a bit thick after having spent a most uncomfortable night. Our truck has one uneven wheel so got plenty of vibration. Pass through Tours. No breakfast forthcoming so open a tin of tongue and sausages and the syndicate devour it. March 18, 1918 Pass through Paray le Monial, Royanne. Beautiful country. Well looked after (the country I mean). Arrive at Rest Camp at St Germain. Sleep in tents. March 19, 1918 Aboard train again with fresh stores bought from canteen. Another member added to the syndicate, Ecroyd, now numbering five. Pass Pierrelatte and Avignon. Stop at nearly every station. Country almost covered with Olive trees. Beautiful weather. 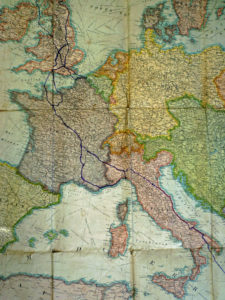 March 20, 1918 Pass through Toulon and later go all along the French Riviera through Cannes and Nice. Beautiful scenery and climate. Stop at Nice a short time. Buy some wine and bread on the station. 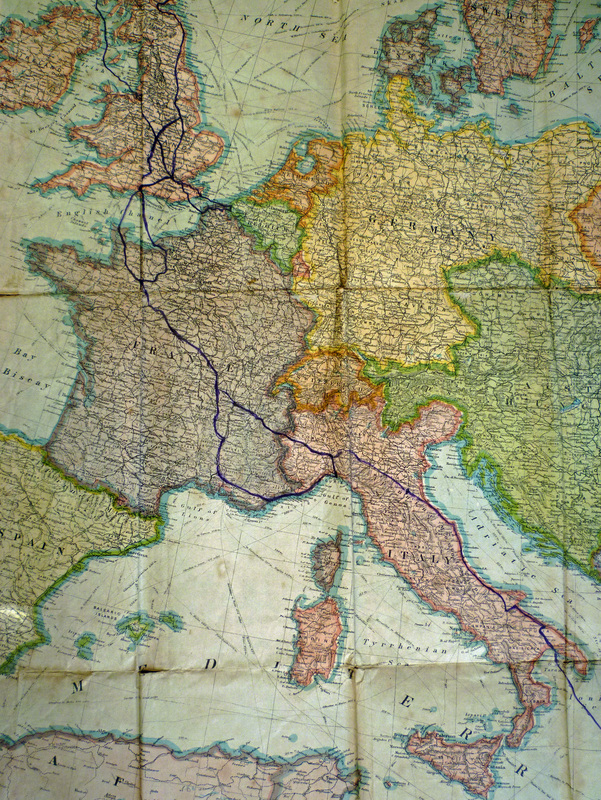 Cross boundary line into Italy about midnight. 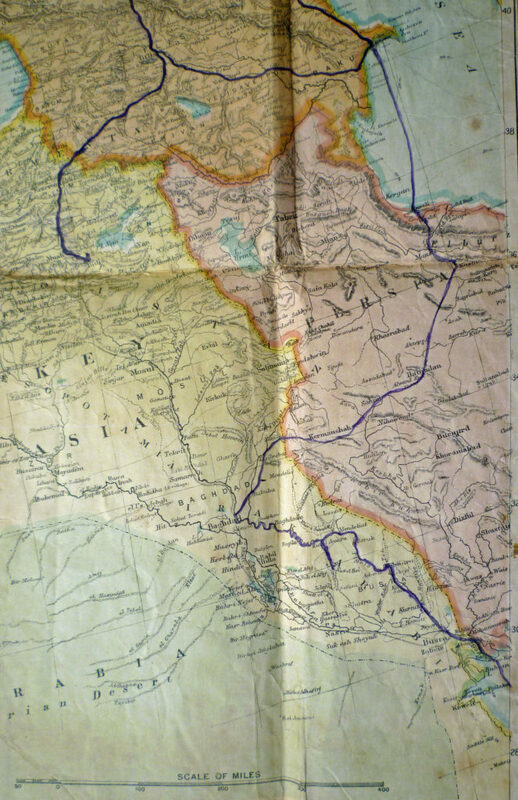 March 21, 1918 Pass along Italian Riviera and arrive at Savona. Getting train ready to cross the mountains, by dividing into two parts and putting two powerful electric engines on each part. Electricity used instead of steam, to keep the tunnels clean and the air better. Going through tunnels miles in length, occasionally coming out into daylight and feeling rather cold finding ourselves up among the snow. Coming down the other side, our old truck, which is in darkness, shakes us from one side to the other but manages to keep on the lines. Get another beautiful view of the Mediterranean, and Genoa where we stay for a short time. Children exchanging oranges for cigarettes with us. Arrive at Faenza and go into a camp for the day. Go aboard the train again at night. Pass Castellammare. March 23, 1918 Going along the shore of the Adriatic. In some places the sea comes within three yards of the railway track. March 24, 1918 Sunday. Arrive at Taranto late in the evening. Hang all our possessions on us and leave the train for camp, to wait for a boat coming in. March 25, 1918 At Taranto camp. Do some washing and visit canteen. 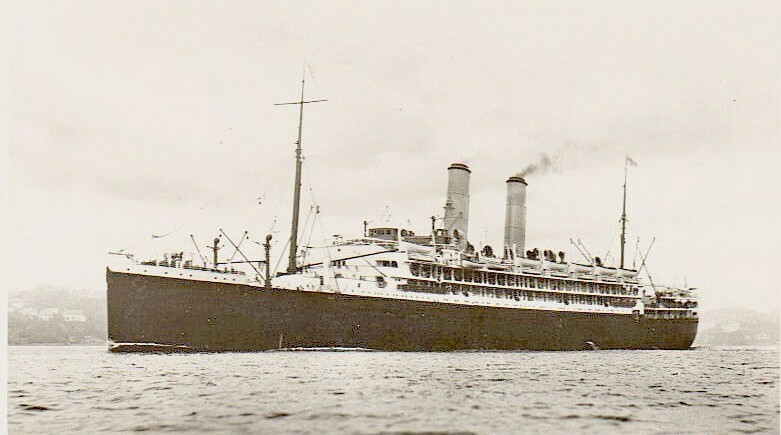 March 29, 1918 Good Friday Leave camp at dawn, march to quayside and wait about four hours before getting on steam launch which takes us out to the boat which is a 15,000 ton liner P&O named ‘Kaiser-i-Hind’. March 30, 1918 Leave Taranto harbour which is surrounded by land with the exception of one narrow strip of water which runs between two high stone walls, dividing the town, with a draw bridge over. Our boat just manages to get out without touching the walls on each side. March 31, 1918 Getting rather hot, sit on deck looking for submarines. Two Japanese destroyers are escorting us, one on either side. April 1, 1918 Very calm sea, not a wave or breeze. Tea and toast before breakfast at 6 am. Living in our life belts, not allowed to take them off for meals even. 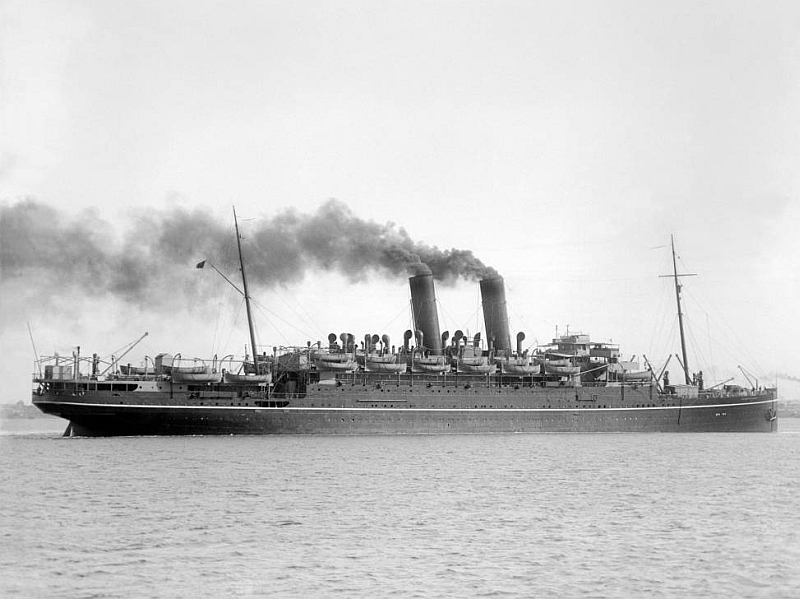 April 4, 1918 Arriving at Alexandria. See wrecks all round the harbour. Sea calm and pale green in colour. Go aboard train, buy some good oranges and journey towards camp, at Sidi Bishyr about five miles outside Alexandria. April 5, 1918 In tents at Sidi-Bishyr. Sand everywhere including our boots, blankets, tea and stew. April 6, 1918 Very hot, our mid-day meal consists of bread, margarine, cheese, onions and oranges. Have a meat meal at 5 pm. April 7, 1918 Go for a walk across sands to Mediterranean and have a lovely bathe. Egyptians selling oranges, cakes and sweets on the beach. April 9, 1918 Go into the town of Alexandria by tram. Plenty of date trees and cactus plants about. Very nice shops and cafes. Walk down the principal streets and have a good feed then return to camp. April 12, 1918 Still at Sidi-Bishyr. Bathe every day and consume from ten and upwards oranges daily, extra large Jaffas. April 14, 1918 Our regular moving day. Getting ready for train again. Go aboard about 2 pm carrying all our belongings. Pass Sidi- Gaber, Damamhour, Tantra change trains at Banka. Country very interesting, see the Nile. Sitting in train in the dark and feeling hungry. Pass Ismailai, and arrive at Port Tewfik near Suez, our destination. Leave the train and march to camp with kit. Nothing doing in food until next day. Flies commence to worry us. Have a good bathe in the harbour. April 16, 1918 Go to the town of Suez by train, just for a look round rather a dirty and smelly place. 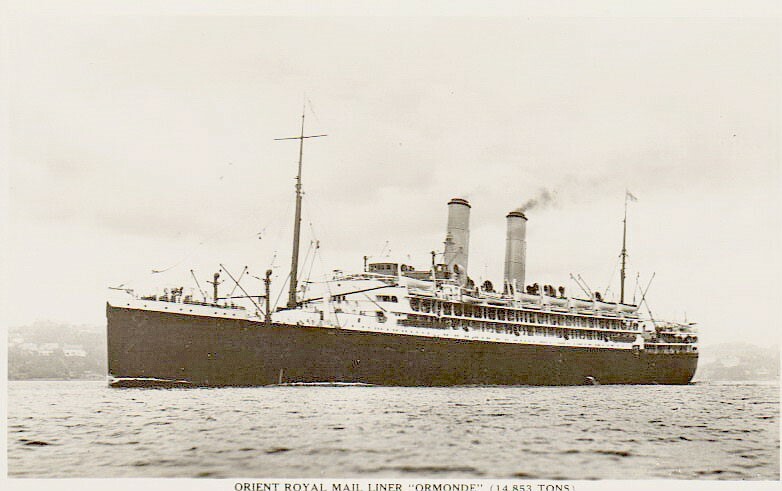 April 17, 1918 Go aboard the ‘Ormonde’, an Orient liner, beautiful boat. April 18, 1918 Leave harbour. Have a very nice cabin and plenty of room to walk around on deck. In the Gulf of Suez. Very nice trip so far with the exception of food, which is very short. April 19, 1918 Getting hotter. I am in charge of the Beer a/c for the Sergeants Mess. April 21, 1918 Terribly hot no air. Pass through Hells Gates and quite hot enough for them too. Wear only thin shirt and shorts and slippers. No ammunition boots allowed to be worn on board. Lie on our beds and wipe up perspiration with towels. Everything damp and sticky, getting, or rather got, quite fed up with the Red Sea and damp heat. Air scoops in port holes to try and make a breeze. April 22, 1918 Everyone feeling half dead with the damp heat. Too hot to sleep even at night. April 25, 1918 See flying fish, turtle, dolphins and porpoise jumping about on the water. Oh! for a little of their energy. Just to make things harder we are inoculated. My 19th time. April 26, 1918 See whales shooting water up in the air. Still feel half dead. April 27, 1918 Arrive in Henjam and stop to coal. Natives bring coal out in wooden boats and slowly commence to load us up. Each one stops every hour or so and says his prayers kneeling down on a mat. May 1, 1918 Climate a good deal better, quite as hot but a dry heat. Arrive outside Basra although we cannot see land, our large boat cannot go any further. May 2, 1918 Unloading frozen lamb from our boat to smaller boats which have come alongside. May 4, 1918 Turned out of cabins to let Indians, returning home, in. Night on deck. May 5, 1918 Nothing issued in the way of food since yesterday mid-day. Go aboard smaller boat the ‘Barala’, a dirty, smelly boat, feeling terribly hungry and very bad. Some salt bully issued about 12 am (Good stuff for thirst ). May 6, 1918 Going up the Shat el Arab. Pas Basra and go alongside the quay at Magil. May 7, 1918 March to Makina Camp and join other fellows who came out on the draft before us. Receive mail. Inoculated for the twentieth time. May 9, 1918 Everywhere very dusty. Living in marquees. Parade 5.30 am to 7.30 then 8.30 to 11.00 am. Then go to tents and lay down, too hot for anything else until evening. May 11, 1918 Reveille at 4.15 am. Ready to leave Makina for the boat, which is to take us up the river. March five miles to quay and go aboard paddle steamer with a large barge fastened on each side loaded with cars, stores etc. At night air thick with mosquitos and flying beetles. Fellows sleeping on deck under mosquito nets but cannot keep them all out. May 12, 1918 Steaming up the Tigris. Pass several native villages built up entirely of rushes and mud. 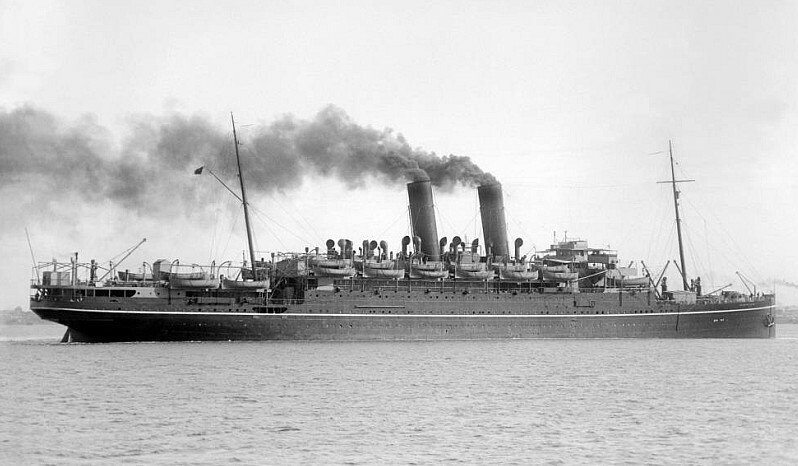 May 13, 1918 Arrive at Amara. Go ashore for a little exercise. Our little party of four buy 18 tins of fruit which is our principal food during the heat of the day. May 14, 1918 Terrible hot. Panting. No energy. One of our barges sink, through hitting the bank and springing a leak. Too hot for anything but to drink water. 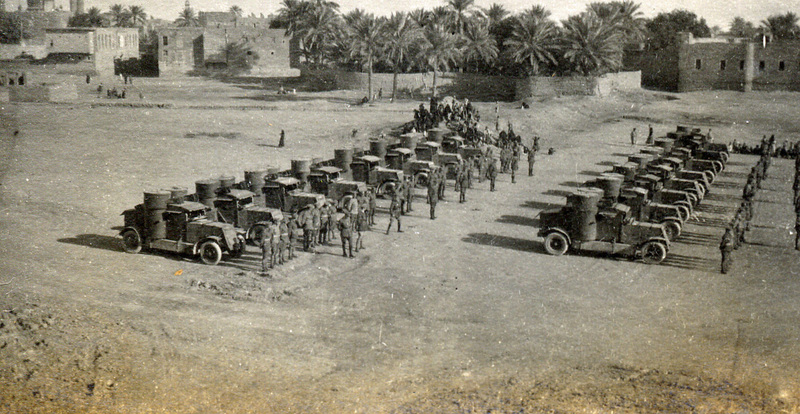 May 15, 1918 At Kut-el-Amara. Hot winds blowing, scorch everything up. Almost choking for a breath of fresh air. May 18, 1918 Go ashore again, about four miles this side of Baghdad, at a camp at Hinaidi.